Hunting Trips in Maine – To learn about hunting license requirements, bag limits and other details for in-state and out-of-state residents, please visit Maine’s Department of Inland Fisheries and Wildlife. Note: NEOC is not responsible for providing visitors the proper licensing or documentation. Call 1-800-634-7238 to ask us about the current hunting conditions and to customize your perfect Maine adventure! Hunting for: Whitetail Deer, Moose or Bird and Bear Hunting. Private hunting with a guide for 1 week, 1 week lodging and all meals. Private hunting with own guide for 1 day. Includes a bag lunch. 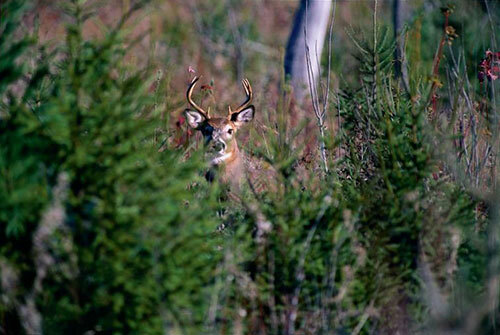 Hunting trophy whitetail deer in Maine is one of the most challenging hunts available today. Hunting these big whitetails takes commitment, dedication and the spirit of a true hunter. Increasing numbers of deer, access to thousands of acres of private land and quality accommodations make NEOC the perfect choice for hunting whitetail deer. You may hunt on your own or from our stands. With a lot of hard work, a little luck and a steady hand, your name may be added to those who have met the ultimate hunting challenge — the trophy whitetail buck. During the course of the year, Maine is home to many Woodcocks, Canadian Geese, Snow Geese, Mallards, American Coots, Redheads, Crows and other migratory game. At New England Outdoor Center we offer guided or non-guided wilderness area hunting trips featuring great landscapes for both walking and driving. Increasing numbers of game, access to thousands of acres of private land make hunting for waterfowl and birds in Maine, a remarkable and challenging experience. Our guided partridge hunting and whitetail deer hunting experiences can be combined to maximize the success of your hunting adventure. The New England Outdoor Center offers lodging for people doing moose hunts in the Katahdin region of Maine. According to Maine’s Department of Inland Fisheries and Wildlife, Maine’s moose population is estimated at 29,000. The average statewide success rate for bagging a moose is over 80%. Every year, several moose exceed 1,000 pounds dressed weight. Trophy racks are not uncommon. More information on obtaining a Moose hunting permit is available at Maine’s Department of Inland Fisheries and Wildlife Web site. *$2,500 for permittee and subpermittee all meals and lodging and guide. Hunters need own permit. Extra/night pp for others in party.